Bee®是从儿茶树的树心部分萃取的天然染料，属于植物染料的助燃剂，在染色过程中，随着预处理助剂的变化，可使浅棕色的颜色变深。 Bee® is natural dye extracted from heart wood of Acacia catechu, this is mordant category of dye in natural dyes. This gives brown light to dark color changes with changes with the change of pretreatment auxiliary in the process of dyeing. 药用价值：杀菌剂，止血剂，具有抗菌性能（参照：印度阿育吠陀药典，证书：Eco Lab, IIT Kanpur） Medicinal Values: Antimicrobial, Astringent, Anti-bacterial 其他证书：(i) 全球有机纺织品标准（GOTS）第三版本，由荷兰的控制工会签发 (ii) REACH预认证 Other Certification: (i) Global Organic Textile Standards (GOTS) Version-III, by control Union, Netherlands (ii) REACH pre registration 最好的废物：Bee®是从儿茶的树心部分萃取的。首先大量使用的Katha是用萃取物制造的，接着其余料用再次被萃取出染料物质。芯材来自森林地区，需要耗费大量的劳动力来收集原材料。当你使用Bee®染料时，你间接地支援了上万与木料收集相关人员的生活来源。 Best of the waste: Bee® is extracted from heart wood of Catechu. First the largely used Katha is made from the extraction then the remains are re-extracted for coloring contents. Heart wood in a forest area, it involves a very large number of labor who collect the raw material. When you consume Bee®you indirectly support those thousands of people who as associated to this wood collection for their living. 应用：Bee®是属于植物染料中的助剂类型。对于棉织物，用VegePlus BS / VegePlus SP / VegePlus助剂进行预处理是必要的过程。它能改变颜色的色光。Bee®助剂适用于缸染和持续染色，是最重要的植物染料之一。 Application: Bee®is Mordant category of natural dye. For Cotton it is a must that textile is treated with pretreatment auxiliaries VegePlus BS / VegePlus SP / VegePlus. This change in auxiliary give tonal change in color. 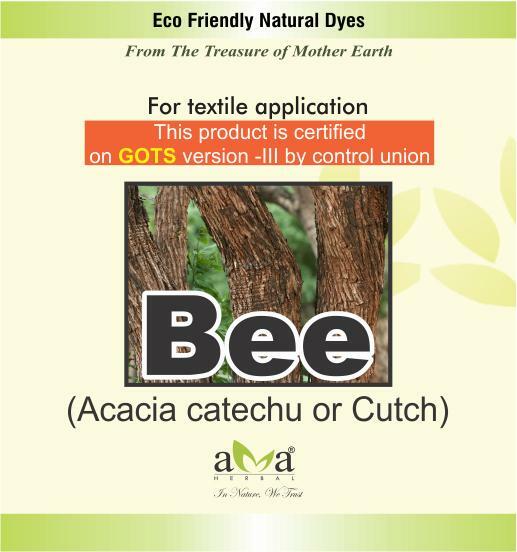 Bee® is suitable for dyeing on batch and continuous dyeing. One of the most important dye in natural dyes. Pretreatment Aulxilary 预处理助剂	Color FromeBee® Bee®可染的颜色	Suitable Machine 适用的机器 VegePlus	Pale Brown浅棕色	*J, SF, C, RO VegePlus BS	Brown棕色	*J, SF, C, RO VegePlus + VegeDeep	Gray灰色	*J, SF, C, RO **J: Jigger, SF: Soft flow, C: Continuous, RO: Rope **J：卷染机，SF：溢流染色机，C：连续染色机，RO：束状染色机 On Different Fibers不同的纤维 Fiber 纤维名称	pH 酸碱度	Final Shade 最终色光	Addition to dyebath 染缸中的添加物 Cotton棉	7-8	Brown棕色	1% Soda Ash苏打灰 Silk真丝	4-5	Lite Brown浅棕色	1% Acetic Acid乙酸 Wool羊毛	4-5	Lite Brown浅棕色	1% Acetic Acid 乙酸 Recommended Percantages建议浓度 Exhaust Process 排气过程	Pad Process 填料过程 2-10% Bee® 2-10%的Bee®助剂	5-30g/l Bee® Bee®助剂5-30克/升 Depending of the depth of shade 依据色光的深度	Depending of the depth of shade 依据色光的不同深度 Bee®可与其他植物染料一起使用（如：Nimbus, Mallow, Rennet, Kareel, Insect, Rubia等）以产生新的色光。但是不能与生物靛蓝染料一起使用。但对于绿色色光，可通过生物靛蓝套料Bee®助剂来获得。 Bee®can be added with other natural dyes like Nimbus, Mallow, Rennet, Kareel, Insect, Rubia etc. 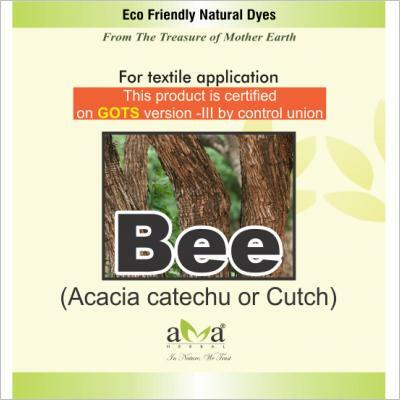 for new shade, but cannot be mixed with Bio Indigo however for green shades, Bio Indigo dyed shade can be overdyed with Bee®for green color. 包装规格：5公斤，25公斤 Packing Size: 5KGS, 25KGS 重要提醒： Important Attention: 货架储存的有效期是2年，理想的贮存条件是10℃到 30℃ 这些信息是基于我们公司现有的技术知识和经验所得出的。不能作为第三方机构和国外法律的责任标准。使用者在正式投入到大货生产中前，需自行测试和调试。我们对使用场所，应用方法，任何方式产生的任何后果都不承担责任。须有使用者各自的安全数据表对应张贴的条规和防护措施作出建议/通知。 Product has a shelf life of 2 years, ideal condition of storage is at between 10℃ to 30℃ These information are based on our current technical knowledge and experiences. They are, however, without liability regarding property rights of third parties and foreign laws. The user should test for himself and try on lab sample prior to taking in to bulk use or production. We are, above all not liable for fields, methods of application and any consequences in any manner. Advice for marking regulations and protective measures can be taken from the respective safety data sheet.